Dr. Ricardo R. Gonzalez is native of the Rio Grande Valley. He grew up in Edcouch, Texas and graduated from Edcouch-Elsa High School. He received his Bachelor’s degree from the University of Houston. In 1983, Dr. Gonzalez completed his externship at the U. S. Naval Air Station Hospital in Corpus Christi, Texas. He received his Doctor of Optometry degree from the University of Houston, College of Optometry in 1984. Upon graduation, Dr. Gonzalez returned to the Rio Grande Valley where he has been practicing since July 1984. He is therapeutically licensed and holds an Optometric Glaucoma Specialist certification. Dr. Gonzalez is an active member and past-president of the Rio Grande Valley Optometric Society and also a member of the American Optometric Association and the Texas Optometric Association. Dr. Gonzalez has been voluteering his time in several non-profit organizations in the Valley for many years and is currently the Vice-Chairman and past-Chairman of the Workforce Solutions Board of Directors. He has also been a member of the Edcouch-Elsa Rotary Club since 1994. He has also been serving as member and former officer of both the Delta Region Revitalization Corporation and the Edcouch-Elsa-La Villa Chamber of Commerce. 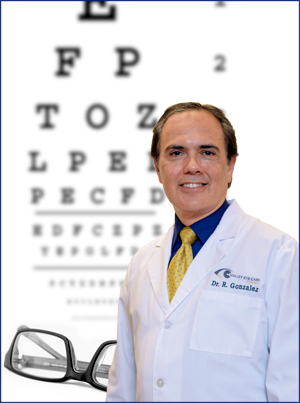 Dr. Gonzalez has extensive experience in family eye care (adults and children), including dry eye management, computer vision problem-solving, contact lens design and evaluation, glaucoma evaluation and treatment and LASIK and cataract surgery co-management. Dr. Gonzalez also treats eye allergies, infections and eye injuries. Dr. Gonzalez, as an independent doctor of optometry, opened his current optometric practice called VALLEY EYE CARE in Elsa, Texas. Opened in August of 1988, Valley Eye Care & Optical is a full service optometric clinic, offering comprehensive eye examinations for all ages. Prescription reading, computer, driving, safety, sports and sun glasses, including contact lenses are all available at Valley Eye Care & Optical.